Inside Siena's Duomo is a room, off to one side, that hosts one of the most colourful and elaborately decorative fresco cycles of the turn of the sixteenth century. The Piccolomini Library was painted by the Perugian painter Pintoricchio (Bernardino di Betto) in 1502 for his patron, the cardinal of Siena, who wished to honour his uncle Pope Pius II who died in 1464. (The unfortunate cardinal Francesco eventually got promoted to the Papacy and died 10 days later!) 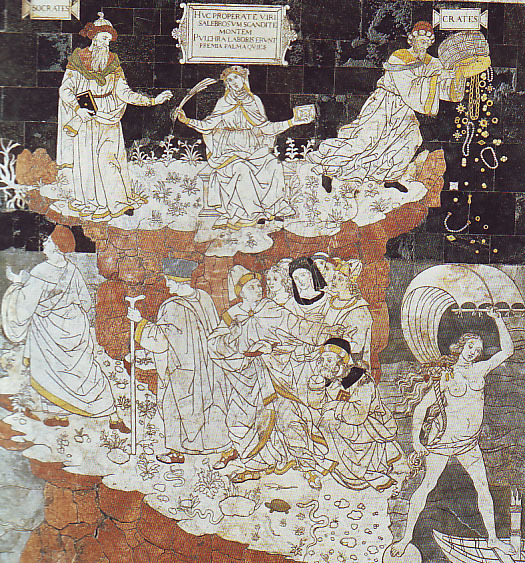 Pope Enea Silvio Piccolomini was one of the greatest humanist scholars and the library in Siena was built to house his precious collection of illuminated manuscripts. The frescoes in the large lunettes that line the walls tell the story of the Pope's life, while the surrounding decorative elements and ceiling are in the "grotesque" style that imitates ancient Roman examples that were very popular with artists and humanists at the time. Pintoricchio excelled in the creation of decorative patterns, costumes, and bright colours. 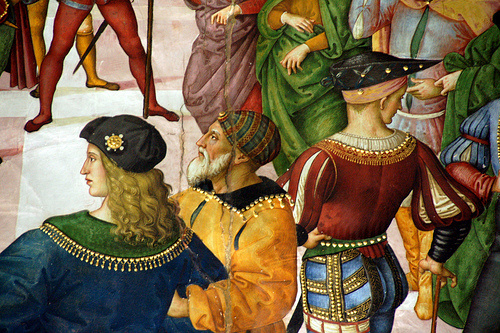 His frescoes contain a curious range from naturalistic features - like the storm scene over a fantastical version of Genova in the "Departure of Aeneas Silvius for Basel" or the detailed plant samples at the bottoms of the paintings - to the rather bland expressions of the characters themselves (in this he takes after his fellow Perugian, Perugino, whose faces all look the same). Pintoricchio transplants his style, developed in the provinces and matured in Rome, to turn-of-the-century Siena, where he found himself somewhat influenced by the local artist Domenico di Bartolo but continued to paint in a way that was foreign to Siena. As far as I can see, despite the masterly treatment on these frescoes, Pintoricchio's style had no influence at all on local painters. Perhaps my readers will know better and add their opinions on the matter in the comments. Two other things not to miss while you're entranced by the frescoes. First, don't forget to look at the books! Second, on your way out, look down - near the entrance to this space, the artist also designed one scene of the famous floor decorations; the "story of Fortune" illustrates the virtuous road to knowledge and can be considered part of the same iconographic programme.